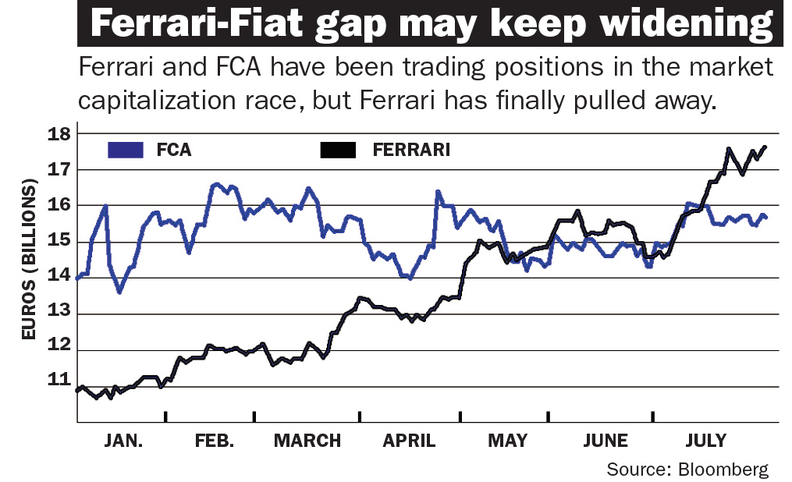 Ferrari has blown past former parent Fiat Chrysler Automobiles in the race that might matter most -- market capitalization. Ferrari was spun off from FCA in late 2015, and its stock has been on the rise since early July, when it was trading at about $85 per share. Last week, Ferrari reached nearly $112 a share, giving it a market cap of more than $21 billion. Meanwhile, FCA's share price, which was under $10 per share in late April, was trading at more than $12 a share last week, giving it a market cap of about $18 billion. Ferrari's valuation began to overtake that of its former parent in early May. Like an F1 race, the companies have traded paint -- and position -- from May to July, when Ferrari finally began to put some separation between itself and FCA. At the wheel is Sergio Marchionne, CEO of FCA and Ferrari.